On February 9, 2012, a man from Rockford, Illinois, filed a suit against Swedish American Hospital, and its employees. The plaintiff is represented by Devon C. Bruce, of Power Rogers & Smith, L.L.P. The lawsuit seeks to hold the doctor and hospital responsible for its role in placing radioactive seeds in the incorrect position during treatment of his prostate cancer, which caused severe injuries to the plaintiff. The complaint alleges that plaintiff had prostate cancer and was admitted to Swedish American Hospital to undergo brachytherapy I-125 Seed implantation per the advice of a Swedish American Hospital’s doctor. While in surgery, the doctor deviated from the standard of care; the doctor committed an error by not placing the brachytherapy seeds in the proper location. Specifically, the doctor wrongly placed the brachytherapy I-125 seeds into plaintiff’s bladder, mesentery, bowel wall, bladder wall and bowl lumen. As a direct result of these deviations, plaintiff suffered injuries and will incur additional treatment in the future. Prostate cancer is the most common cancer in men, and the second leading cause of cancer death among men in the U.S. Recent studies suggest that about 180,000 new cases of prostate cancer will be diagnosed in the United States this year alone. Radiation therapy is one type of treatment available for patients with prostate cancer. Radiation therapy is the use of high-energy X-rays, electron beams or radioactive isotopes to kill cancer cells and shrink tumors. Prostate brachytherapy, the procedure used by the doctor at Swedish American Hospital, is a form of radiation therapy. 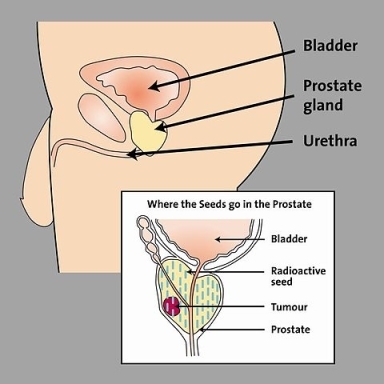 In prostate brachytherapy, tiny radioactive pellets, the size of a single grain of rice, are implanted directly into the site of the tumor, in the prostate. These pellets can be temporary (removed after the proper dose is reached) or can remain in the prostate permanently. The size and location of the cancer determines the proper number of pellets to be implanted in the patient. The implant procedure takes about one hour and is often done on an outpatient basis. Although the pellets deliver a higher dose of radiation than the external beam procedure, the radiation travels only a few millimeters and therefore is unlikely to extend far beyond the prostate. Prostate brachytherapy is considered to be an effective treatment, which does not involve a major surgery, and it allows a patient to preserve their quality of life. Plaintiff’s injuries were entirely preventable had the defendant abided by the standard of care, and exercised due care in the placement of the brachytherapy I-125 seeds into the plaintiff. The picture is licensed under the Creative Commons Attribution-ShareAlike 3.0 License. From Wikipedia, the free encyclopedia.